The Montclair Music Studio is proud to introduce woodwind instructor, Dane Alexander. Born in Florham Park, NJ, he has studied music for over twenty years. Dane received a Bachelors of Fine Arts in Jazz & Contemporary Music with a concentration in Sax Performance from the New School University. Dane believes that building a strong foundation and understanding of how to practice is key in developing musicianship. 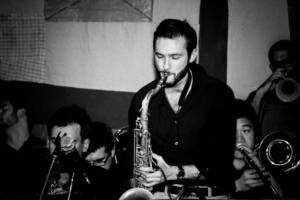 Dane teaches saxophone, clarinet, and flute. He is currently accepting students on Thursdays, Fridays and Saturdays. When I was very young, I would sit at the family piano and just pick out tunes by ear. That eventually led me to take formal lessons. I remember hearing Miles Davis’ album “Kinda Blue” and thinking that was some really cool stuff! I was sort of obsessed with it as a kid and still am today. I started taking piano lessons with the church organist at about 7yrs of age. Later in elementary school I began clarinet lessons and played in the school band. That was a pivotal moment for me, because I really wanted to play the drums, however one of my [well-meaning] teachers dissuaded me. I tried playing the alto saxophone, but at the time I was too small to even hold it up! I continued playing both piano and clarinet until I reached high school, when I finally took up the saxophone. My mom sings in church choirs and my dad is a self-taught guitarist. they both have careers outside of music, but even today it’s an integral part of their lifestyles. My two younger brothers took music lessons; one of them eventually pursued a career in audio technology. Outside of high orchestra and marching band, I played in the pit band during school musicals. In college I played in a number of different school-sponsored groups. Notable ones are the New School Afro-beat big band, and the R&B Revue directed by Bernard Perdie. What other types of instruments are in your repertoire? I play sax, flute, and clarinet nowadays, and focus on teaching woodwinds. However I can also play guitar, piano, bass, and drums, but mostly in my spare time. I can whistle well too, but don’t know how or why. I play mostly in the NYC metro area and Philadelphia. In NYC, I play at The Bitter End, Fontana’s, Sullivan Hall (formerly Lion’s Den), Santo’s Party House…the list goes on. In New Jersey: Hat City Kitchen, DLV Lounge, Tierney’s, Mexicali Blues, and a bunch of others. I like to ski and play golf. I also try to cook when I have the time.